California Democratic congressional candidate T.J. Cox has claimed that he has "deep roots" in the 21st congressional district, but he has not received a single donation from within the district. Cox, who was originally running in the crowded Democratic field of the 10th congressional district, announced early last month that he would be switching races to run in the 21st district. "Let me be very clear: My decision to move our campaign back to this district is about the thousands of Californians in the Central valley — from Tranquility to Arvin — that stand to lose access to health care under the status quo," Cox wrote. In his letter to supporters and friends, Cox does not say his move was influenced by Democrats' highly competitive "Red to Blue" program, which is aimed at unseating Republican lawmakers in districts across the country. About a week after Bakersfield attorney Emilio Huerta announced that he would not be challenging incumbent Rep. David G. Valadao (R., Calif.), Cox made his announcement to jump into the race. 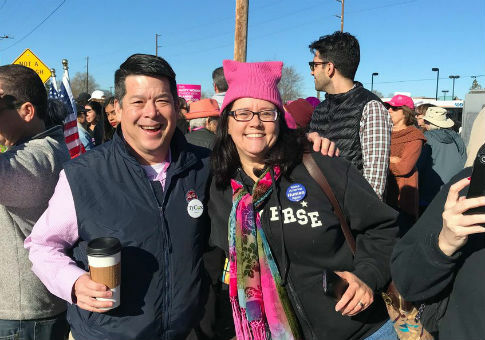 Cox, the president and founder of the Central Valley NMTC Fund, which invests in economically disadvantaged areas in the valley, moved to Modesto last summer to run in the 10th district race, but he has now moved back to his house a few miles outside the 21st district. Candidates in California don't have to live in the districts that they run in, but residency can become an issue for politicians seeking to earn voters' trust. While Cox claims that he "work[s] every day in the 21st" and has "deep roots" in the community, he has not received a single donation within the 21st district, according to the most recent FEC filing. Valadao campaign spokesman Cole Rojewski said Cox's situation shows how unconnected he is to the 21st district. "Our opponent's lack of support from inside CA-21 should come as no surprise," Rojewski said. "He's not from the district, doesn't live in the district, and doesn't know the people from the district. Instead, he was hand-picked by Washington Liberals to fulfill their special-interest agenda." Cox is only the latest candidate to run to represent a district he does not reside in. Democrat Jon Ossoff ran for Georgia's sixth district despite living outside of it in a special election last year, losing to Republican Rep. Karen Handel. This entry was posted in Politics and tagged 2018 Election, California, House Democrats, Jon Ossoff. Bookmark the permalink.